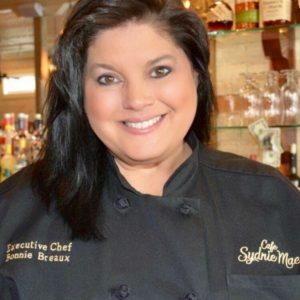 « Guest Speaker: Buz Bullock - "The Mystery of the Shipwreck, El Cazador"
Guest Speaker, Chef Bonnie Breaux is the 2018 Small Town Chef of the year and Executive Chef at Café Sydnie Mae in her hometown Breaux Bridge, Louisiana. Chef Bonnie shares her culinary experiences as they take her from her early beginnings at Breaux’s Cajun Catering in Covington and then back home again to Breaux Bridge. In 2017 Chef Bonnie Breaux was the only female to compete in the 2017 Louisiana Seafood Competition. Winning this competition, Chef Bonnie now holds the title of “Queen of Louisiana Seafood.” Chef Bonnie’s signature dishes would be a welcomed addition to your Thanksgiving and Christmas Celebrations. Free Admission – Doors open at 1:30 p.m.